Photo of BookCamp sessions by Chloe Ellingson. Last February, when three of the four major publishers in Canada pulled out of Toronto’s annual book industry trade show, BookExpo sadly bit the dust. The collective feeling, particularly amongst small press publishers and indie booksellers, was “where do we meet now?” The book industry is in trouble, and even major publishers are scared stiff by spiralling sales and the rise of ebooks. And so, with a need for real discussion, BookCamp was born. 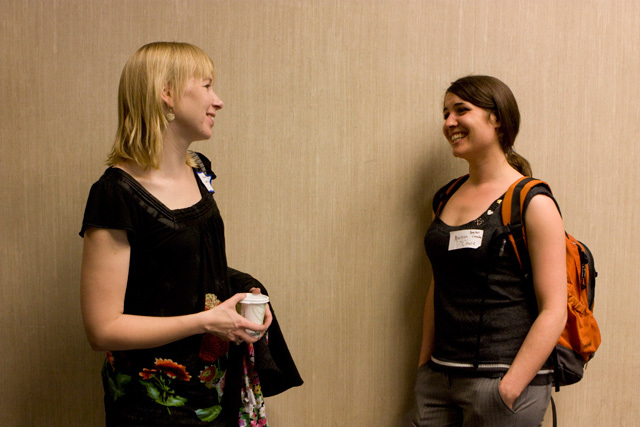 These so-called unconferences (you’ll recognize them by the upper-case Camp on the ending) are free-form meetings where participants, rather than official presenters, provide the content. The idea is modeled after BarCamp, created in Palo Alto, California, in 2005, when a bunch of hot-headed tech nerds decided to create their own conference after being cut out of publishing whiz Tim O’Reilly’s parties. Since then, the unconference has spawned spin-offs around the world, including DemoCamp, Toronto’s own version of BarCamp, which takes place in the dive bar Imperial Pub at Dundas Square. The book industry, so often accused of coming late to the digital party, has fittingly adopted a tech industry model for sharing ideas. 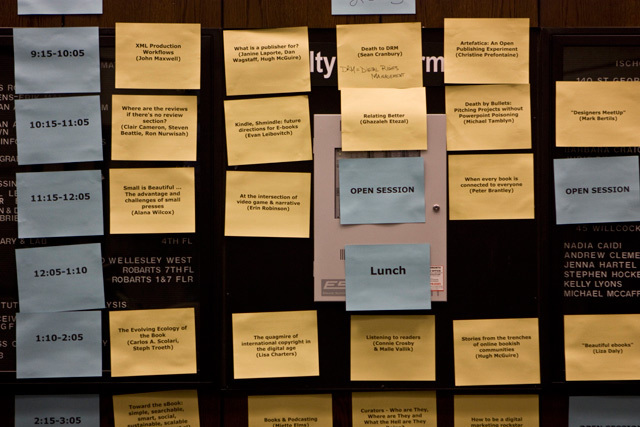 The confusing part of an unconference is how easy everything is. Unlike the traditional entrance, where a gaggle of volunteers take your name, sign you in, dispense name tags, and usher you into a room of white-clothed tables, it’s much easier to simply stumble in. This is exactly what happened Saturday morning when we arrived. 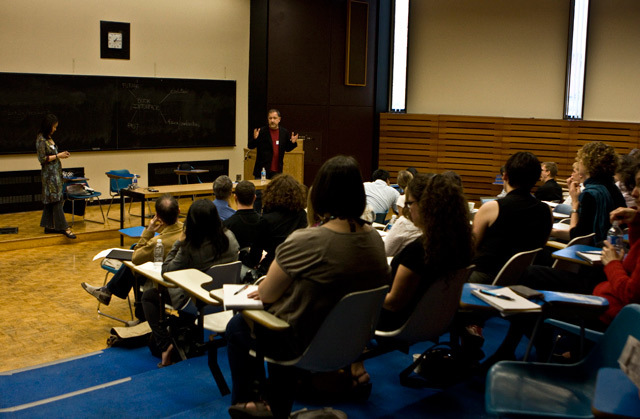 After passing by a few hand-scrawled signs with “BookCampTO Here” on them, we found ourselves right in the middle of a presentation by Simon Fraser’s John Maxwell, without even a cup of coffee in hand yet. Inside the fluorescent-lit room of U of T’s Faculty of Information School, many of the BookCampers were still waking up, and so Maxwell did most of the talking. Upstairs, though, a lively conversation on Digital Rights Management (DRM) was taking place. DRM has become a contentious point amongst, well, pretty much anyone who uses the internet. It refers to how rights holders enforce the use of their content, used up until recently for digital music sold by iTunes and Walmart. Led by Sean Cranbury, a self-described book publishing enthusiast, the conversation focused on DRM as an impermanent and imperfect solution to regulating online piracy of music, movies, and now books. Although many participants agreed that giving away writing translates into more readers, the session ended on a more practical point: what are authors going to live on without the already meager profits made from writing? No one seemed to know the answer to that question just yet. The DRM conversation was the equivalent of a grad seminar on steroids. When one person finished speaking, another person piped up, making the exchange of ideas almost seamless. When one topic slowed, as if on cue someone would say “what about…?” and the discussion launched forward again with barely a pause. If we didn’t know better, we’d say it was staged, but alas this miracle repeated itself several times throughout the day. In the afternoon, at a session on international copyright in the digital age, Random House’s Linda Charters spoke about the challenges facing the book industry as it moves into ebook territory. Many consumers are unaware of the territorial rights governing international authors, meaning that publishing company “A” has the contractual right to sell author “B” within a certain country. These rights (many of which have several years to expire) are rendered worthless in a global ebook market. At least two other ebook companies were at the talk and answered questions about what stage their technology is at and how they’re collaborating with publishers to improve the system. Anansi Press president Sarah MacLachlan said that her indie press is planning to offer ebooks in a way that won’t significantly alter the amount of money paid to writers, causing all of the authors in the room to breathe a collective sigh of relief. Photo of Alana Wilcox of Coach House Press chatting with a BookCamper by Chloe Ellingson. In other sessions the format was more question-and-answer, such as Mitch Joel’s talk on digital marketing. Joel, a professional marketer and blogger extraordinaire, explained that writers should never give their books away for free. This contradicted many viewpoints expressed that day and generated tweets like, “Don’t give away your book for free. Not one chapter. Don’t agree.” Joel believes that, unlike musicians who can make money from touring and merch, writers usually have just one product, and if they give that away, they don’t have anything else to sell. Instead, he encouraged writers to build their readership through blogging and other online platforms until eventually fans pay money to hear more ideas when a book is published. The idea certainly piqued the attention of audience members, who lobbed questions and contradictions at Joel for the better part of an hour. At the end of the day, many discussions focused on how to realign the industry. Somehow, the community needs to figure out a way to confront and profit from the digitization of books. Although this dilemma is far too mammoth to solve in one day, BookCamp certainly delivered on its promise of “a conversation about the future of books, writing, publishing, and the book business in the digital age.” Judging from the tweets throughout the day, most attendees were pleased, if not ecstatic: “Haven’t had such great conversations about books in forever,” posted one. “Trying to recover from BookCamp Toronto. It’s going to take a few days for all of the insights to sink in,” said another. Too bad about BookExpo, but with BookCamp around, we don’t think anyone will miss it that much.